Net Operating Profit after Tax (NOPAT) is a profitability measurement that calculates the theoretical amount of cash that a company could distribute to its shareholders if it had no debt. In other words, this is the amount of profits that a company makes from its operations after taxes without regard to interest payments. If the company had no obligations on the books, it would be able to distribute this entire amount of money to its shareholders at the end of the year. Definition – What is NOPAT? Both investors and creditors use this financial ratio to gauge how profitable a company’s operations are and how able they are to pay shareholders and debt obligations. Typically, they only use this as a gauge because it’s not an exact measurement. The accrual method of accounting typically creates timing difference between when earnings are recognized for book purposes and when they are recognized for tax purposes. Thus, there is usually a difference between the actual money that can be distributed to shareholders and the amount calculated. Analysts also use this calculation as a measure of operating efficiency since it calculates how profitable a company’s operations are without considering its financing structure. For this reason, NOPAT is typically considered the most accurate measure of operating efficiency for leveraged companies. Analysts also tend to use this in other free cash flowand economic value added calculations. Let’s take a look at how to calculate NOPAT and what equations are used. The NOPAT formula is calculated by multiplying a company’s operating income by 1 minus the corporate tax rate. As you can see, it’s a pretty simple formula to calculate. The operating profit, net income, and interest expense should all be reported on the income statement. Occasionally, the tax rate is reported on the face of the financial statements, but most of the time it isn’t. You can either find the appropriate tax rate by looking up the corporate profits for the year in the IRS publications or you can check the financial statement notes and management analysis and discussion. Public companies should also have public records of their tax rates. Now that we know how to calculate the NOPAT equation, let’s take a look at an example. Net Profit: Net money remaining with the company after paying for all types of costs and expenses. Let’s calculate Brighter Corp’s NOPAT using both of our two equations. It’s no surprise that both the methods gave us the same result. Interestingly, the net profit of the company is $28 but if the interest component is removed the NOPAT becomes $35. Obviously, if the company doesn’t have debt on its books than Net profit will be equal to NOPAT. For a company, operating profit and net profit are two very important parameters. Operating profit tells us about the operating efficiency of the company while net profit is a measure of overall profitability of a company. However, both these parameters have certain limitations. Operating profit doesn’t take into account the tax implication on the profitability, while net profit includes the impact of interest payment (and the corresponding tax benefit – remember tax is calculated after reducing interest payment). This is where the concept of NOPAT comes in. It is the operating profit of a company after reducing the tax. This hybrid calculation can help us understand the operating performance of a company without the influence of debt. Let’s look at a real world example now. We compare Wal-Mart and Costco. It is worth highlighting that for an effective comparison we should select peers within the same industry. Further, it is also a good practice to select companies of comparable size and similar business models. If we select companies that are too small, the comparison may be inaccurate. With size, a company gets better operational efficiency. Thus, the comparison may unduly penalizing the smaller peers. Any ratio or number may not be very useful on a standalone basis. It has to be compared to the company’s own history and others within its industry. Historical analysis will tell is if the company has improved its performance or not. While peer analysis will tell us how the company stakes within the peer set in terms of operational efficiency. In our Brighter Corp example, the company had a net operation profit after tax of $35. This means that if the company had no debt, it would have $35 left over after all of the operating expenses and taxes have been paid to distribute to its shareholders. This is somewhat meaningless without a benchmark to reference. Let’s assume the industry standard is $55. Brighter Corp is well below the industry standard, but this might have to do with it’s margin or other factors that should be investigated. 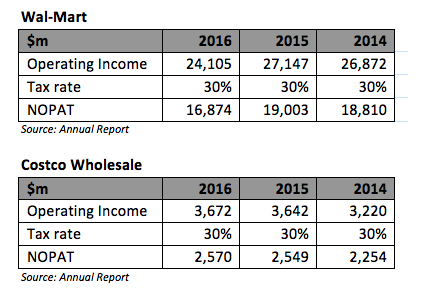 In the example above, NOPAT for Wal-Mart has reduced from 2014 to 2016 while for Costco it has improved. There could be various reasons for this trend such as improving operating margin, changing product mix etc. (Do note that in this article we are not describing in details the concepts such as ‘operating margin’ or other relevant topics such as EVA analysis or FCFF calculations). In addition to analyzing the underlying efficiency of a company and comparing it to peers, analysts also use it to calculate EVA (Economic Value Add) or FCFF (Free Cash Flow to Firm). Without going into the details of what these terms mean, it would suffice to understand these numbers are actively used by analysts to conduct company/business valuation exercise and M&A targeting of potential companies. In the case of acquisition analysis, investors would like to understand the core operating efficiency of a company without the impact of debt on its books. This is important because once they acquire a company, they might replace the debt with their own capital. Hypothetically, if someone wants to acquire one of the two companies mentioned above and has to make the decision purely based NOPAT (i.e. not consider other factors), they will go to Wal-Mart (do note: business decisions are not that simplistic)! In conclusion, through this article, we have tried to introduce an important concept in finance for beginners. As you work your way through different concepts you can start noticing different patterns in the financial jigsaw puzzle and start getting the holistic picture. 1 Definition – What is NOPAT?